Inspired by the ciders of Normandy, France, Joseph Ruwet return to the Herve region of Belgium and began making cider in 1898. The apple orchards near his home tapped the regions rich soil to produce apples perfect for cider making. The Royal Family of Belgium would later name Ruwet as the Official Supplier of the Royal Court. 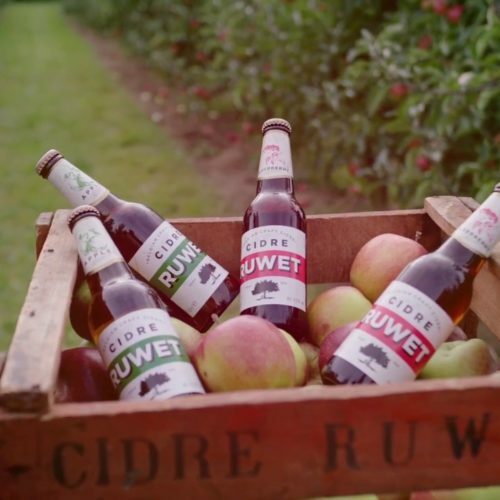 For three generations of Cider making, the Ruwet family takes pride in its Belgian Craft Cider to this day. Cidre Ruwet’s Brut Cidre is a fully dry cider with traditional apple cider flavor and aromas in a elegant bottle-refermented effervescent presentation. At 4.5%, it is easy drinking, crisp, fruity and refreshing. Cidre (or Cider to English speakers) has a long history throughout Europe, primary in western England, Brittany and Normandy in France, northern Italy, and the Basque Country of Spain, all places with excellent apple orchards. PAIRING ONE: Almond Stuffed dates wrapped w/ duck prosciutto and paired with Bière Darbyste, a Saison from Brasserie de Blaugies. PAIRING TWO: Marinated octopus w/ olives and yucca together paired with Coolship Sasha Fontaine 2018, an American Wild Ale from Whiner Beer Company. PAIRING ONE: Fried Pork Rind w/ Whipped Pimento, Bacon Jam, and Chives paired with Brut Cider from Ruwet Ciderie. PAIRING TWO: Rye Toast with Chicken Liver, Fermented Cherry paired with Dryades, an American Wild Ale from NOLA Brewing Co.
PAIRING ONE: Age-Gyoza of pork belly, iceberg, shiitake and shrimp toast paired with Brasserie de Blaugies Darbyste Saison. PAIRING TWO: Handroll of smoked trout, citrus marmalade, and crunch paired with Whiner Beer Company Coolship Sasha American Wild Ale. PAIRING ONE: Crispy potato and octopus with nduja aioli paired with Ruwet Ciderie Brut. PAIRING TWO: Pork belly meatballs with plum sofrito with Hi Wire Brewing Vintage Sour Ale Foeder Aged Sour Ale.